154 pages, 35 B/W Illus. The Artangel Trust has been credited with providing artists with all the money and logistics they need to create one-off dream projects. An independent art commissioning agency based in London, it has operated since 1985 and is responsible for producing some of the most striking ephemeral and site-specific artworks of the last decades, from Rachel Whiteread’s House to Jeremy Deller’s The Battle of Orgreave. Artangel’s existence spans three decades, which now form a coherent whole in terms of both art historical and political periodisation. It was launched as a reaction to the cuts in funding for the visual arts introduced by the Thatcher government in 1979 and has since adapted in a distinctive way to changing cultural policies. 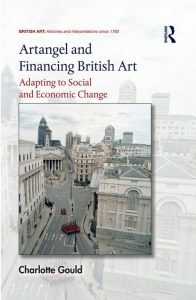 Its mixed economic model, the recourse to public, private and corporate funds, is the result of the more general hybridisation of funding encouraged by successive governments since the 1980s and offers a contemporary case study on broader questions concerning the specificities of British art patronage. This book aims to demonstrate that the singular way its directors have responded to the vagaries of public funding and harnessed new national attitudes to philanthropy has created a sustainable independent model, but also that it has been reflected more formally, in their approach to site. The locational art produced by the agency has indeed mirrored new distinctions between public and private spaces, it has reflected the social and economic changes the country has gone through and accompanied the new cultural geographies shaping London and the United Kingdom. Looking into whether their funding model might have had a formal incidence on the art they helped produce and on its relation to notions of publicness and privacy, the study of Artangel gives a fresh insight into new trends in British site-specific art. Charlotte Gould is Assistant Professor of British Studies at Sorbonne Nouvelle University in Paris, France.